Easter's almost here! Do you have plans to host Easter brunch or have people over to your house this weekend? We have some adorable projects using Mod Podge to give your event just the right touch of spring. Now let's hop to it! This Happy Easter Banner would be perfect to adorn a buffet table! The use of Mod Podge Mod Melts add the finishing touch. How clever is this little bunny? Use two different sized wreaths along with a Mod Melter to attach spring flower flair, and create a Bunny Wreath to give your guests a warm welcome! This chic centerpiece's former life? Reclaimed pallet wood! We love the embellishment of Mod Melt gems in the center of each flower. Transform strawberry containers into your own Easter egg basket and fill with paper mache eggs for a fun centerpiece idea... so easy to make and enjoy! 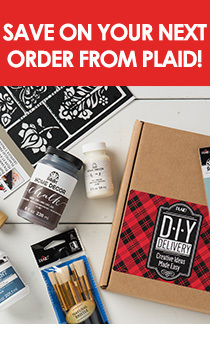 Find all the supplies you need at Plaid Online! "Hoppy" Crafting!